We have seen a number of services recently — take HiMama for example — which are aiming to streamline childcare, enabling parents to stay connected with their kids even when they are apart. Little Peanut on the Go is another such family-orientated platform. 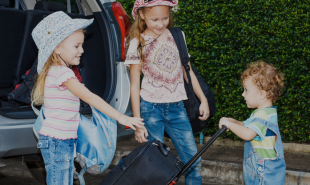 The app — set to launch in April — helps parents prepare for trips and share plans and schedules with caregivers, ensuring that everyone has all the information they need in one place. To begin, users simply download the app onto their iOS or Android device and create a plan for an upcoming trip. They can create packing lists, reminders and to-do lists, and build a schedule for their child’s day or days. They can also add doctor’s information, allergy details and the parent’s contact information, ensuring that the caregiver — whether it be a grandparent, a child-minder or a friend’s parent — can access everything they need in one place, anytime they want. During the trip, the parents can stay connected with their kids via in-app posts and photos. Given that most children are smartphone literate, perhaps the creators could make a fun, child-friendly version, which would get the kids themselves involved, creating an even more connected experience for everyone?